They've built this because the existing westbound platform (left) is slipping down the embankment. It's accessed by a new footbridge which includes lifts, rather than the subway to the existing platform. The station was originally built with space for four tracks so that express trains could run through the middle, but these have long since been removed, leaving plenty of space between the two remaining tracks for the new platform. The station's Wikipedia article has a good "before" picture. Does the existing westbound rail line get retained as a stabling loop under the new plans? Take a closer look at the picture - the new platform faces onto the same track as the old one. There are no changes to the track layout at all, as far as I'm aware. They'll just need to start opening the doors on the other side of the train to bring it into use. They could re-use the old platform canopy to shelter the new one. Shame to waste it. It seems like a drastic solution to the problem. Could they have not just shored up the existing platform? I vaguely recall Greengauge 21 eyeing up the space in their tentative HS2 proposals. I realise that Chiltern Trains have no plans for major suburban service improvement, but didn't the space between the existing tracks leave some possibility for four-tracking in the distant future to improve capacity? Yeah, I did think Chiltern Railways were planning to reintroduce the fast lines at some point, obviously not now. Agreed with anon about re-using the canopy, would be a shame to lose all of it. Wonder what will become of the building on the platform. Is it a waiting room or staff room or something like that, or disused? I loathe infrastructure changes like this. By building on the former trackbed they have ensured that there will be no additional track capacity on this line for the next 40 years. Anon 2 - CR/NR had no choice - the alternative was a very expensive pinning of the supporting embankment, which AIUI would only delay its collapse rather than remove the threat completely. The new platform was the most cost-effective solution. Robert - there is nothing to stop Chiltern/NR four-tracking the stretch between the Ruislips or reinstating the through lines at Beaconsfield, either of which would deliver the additional track capacity you mention. @THC - yes, but will still have to reduce down to two tracks at Denham, instant bottleneck. I don't see your point Robert. 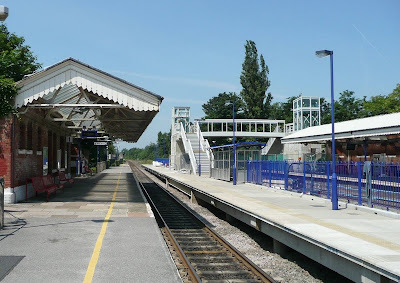 The 'main' line (ex-GC/GW joint line)is two-track throughout, with passing loops presently sited only at Princes Risborough (NB) and West Ruislip (SB). Evergreen 2 (Chiltern's second instalment of their investment programme under their franchise terms) delivered extra infill signalling (to reduce headway), as well as the headline extra two platforms at Marylebone. As a result, twenty paths per hour are available in each direction to Neasden, of which fifteen or so are available up the 'main' line. Given the service Chiltern and WSMR currently operate on this line a 'bottleneck', as you term it, is unlikely to occur just because a platform is built across the trackbed at Denham. This doesn't look as if it is a completely permanent solution. If re-four-tracking the line were to occur, the platform could always be re-re-located (as it were) to make space after having re-enforced the embankment.